Please note that the content of this book primarily consists of articles available from Wikipedia or other free sources online. The Anthony Wayne Bridge was constructed by the McClintic-Marshall Company in 1931, and is a downtown Toledo, Ohio landmark named after General Anthony Wayne. It is a suspension bridge that spans the Maumee River. The bridge has some features that give it a unique aesthetic quality, including a sky blue color and various lattice patterns. 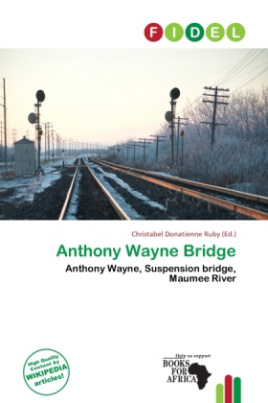 Ohio State Routes 2, 51, and 65 cross the Maumee River on the Anthony Wayne Bridge; it also connects Clayton Street to Woodville Road.